You might have read how much I loved Greg Bear's Halo: Cryptum and that within a short while of reading the last page I had ordered the second in the saga, Primordium. I'm gonna assume you've read Cryptum too as I review it. So do I need to say spoilars? Opening with a very quick recap of the events of Crytum, it's immeadiately clear that this story is a retelling of an adventure that happened to one of the characters from that novel, Chakas. The twist is that he appears to not be himself any more. Is he a collection of thoughts on a disk drive? Has he turned into another being? All, I'm sure is to be revealed. Chakas finds himself crash landed on a Halo and perhaps almost too quickly falls in love (of a kind) with a local 'inhabitant'. From memory, the Halo games have never shown us as having intelligent life (other than plants and the odd bird) so this sets up an interesting premise. But once we are passed that minor hurdle Greg Bear settles into the narrative, drop nice little hints and references along the way about the Librarian, geas and the unspoken plan to keep the reader interested. Finally (and I really do mean finally as it's a bit of a slog) there's a real sinister turn taken where we realise that the Precursor that was revealed to be alive on the last page of Cryptum is alive and well on Halo and seemingly in charge of the bloody thing. Talk about a bad turn... At least Chakas has found Riser and they start a great journey, the end of which signals the climax of the plot arc. Was I satisfied with Primordium? Not really. I found the journey to get the climax long and ponderous. Some of the detail in describing things was so vague as to not be helpful and the climax itself was a convoluted array of ghosts, monitors and walking corpses. That said, it was ultimately a good ending, perhaps just not as exciting as that of Cryptum. 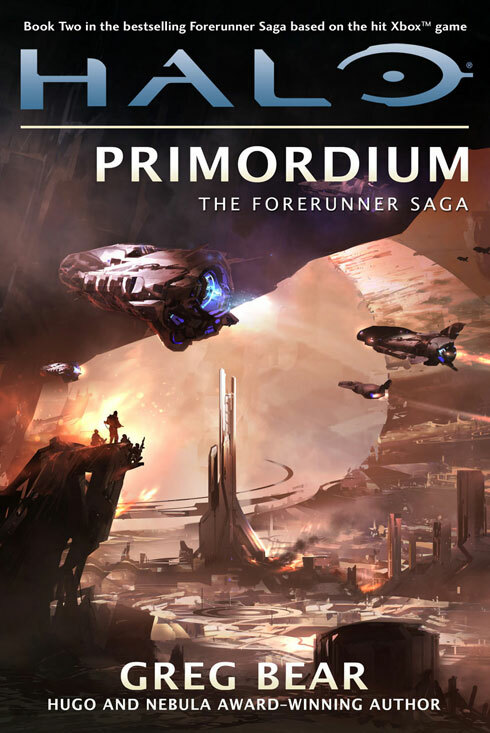 I did feel however that Cryptum and Primordium were both written at same time as the same book, just split in two. I would bet Greg Bear and his 'Halo team' had the trilogy's essential elements well plotted before the writing began (thus meaning a a huge epic novel could have been written - but where's the money in that?!). Thus the scene is set for the third novel in the The Forerunners Saga. Or is it? The third, as yet not named book, is going to only be released after Halo 4.... which you might recall Frankie having said the novels feed directly into that game. It will thus be interesting to see how Halo 4's plot will influence or echo that third novel. Check out my review of Halo 6 or if you're into other science fiction reads, Mortal Engines. Or, see the movie and enjoy Tom Natsworthy's quotes.